Literary heroes Sherlock Holmes and John Watson take on their silliest mission yet. Every once in a while a movie comes along that is so ill received by audiences and critics alike it sparks a curiosity in some in just how bad the movie can be. Late last year, without asking for it, without apologies, and without remorse for the common movie-viewer, we were given such a miserable movie, so void of joy, laughter, heart, fun, style, wit, the list goes on. This movie is Holmes and Watson, and yes it deserves every bit of hate that it gets. I don't even know where to begin with this college humor skit stretched into a feature length film. I could count on one hand the times I had genuine laughter during this ludicrous slog of a movie. I watched this "comedy" with two other friends, and the funniest thing about it was how little we laughed, how silent the room was as we watched the beloved literary characters of Sherlock Holmes and John Watson get absolutely desecrated, decimated and destroyed by the somehow still relevant Will Farrell and the absolute waste of extraordinary talent John C. Reilly (“Boogie Nights”). It is relentless in it's stupidity, the writing is so ham hocked and bloated with idiocy, watch for a full hour and a half as these two buffoons slap each other, piss on themselves, battle killer bees, blaspheme the queen of England (Pam Ferris, “Children of Men”), make lame attempts at humor, I could keep going on and on, but just recollecting this movie is killing more of my brain cells. I don't know what Etan Cohen was thinking while writing this trashpile, the jokes aren't even jokes at all, it's just two dimwits screaming absurd things at each other. I kid you not there is a scene where Holmes and Watson scream for a full minute at the top of their lungs for Mrs. Hudson (Kelly MacDonald, “No Country for Old Men”) to come downstairs, nothing clever or witty, just screaming her name, it's beyond annoying. And that sort of humor is unrelenting, it's every minute of every scene, Etan Cohen wrote a bunch of gibberish on to a piece of paper and called them jokes. There are scenes that make satire of the Guy Ritchie films, but they fall flat. As to make satire of another film, your film should at least resemble that of a coherently written movie, it makes those Guy Ritchie ones feel like masterpieces. It's obvious Etan Cohen was relying heavily, nay solely on the chemistry of the two leads. He wanted to strike gold with another “Step Brothers”, so he put those very characters in a new setting, and called it a movie. There are modern day references that make no sense for the theme, like taking selfies with the queen, and the music goes from orchestral, to modern pop in a jarring fashion, not that everything else isn't distractingly stupid in this hogwash of filth, the darn thing opens with a Hannah Montana quote. Will Ferrell is far past his prime for this sort of silliness, he should be finding different, more mature outlets like his now recently separated company partner Adam McKay (“Vice”). I’m guessing John C. Reilly only did this movie for the paycheck and because he's friends with the director and Ferrell, and he gives his best attempt to bring some sort of humor out of such a lifeless script, but it just never works, this is easily the biggest red mark in Reilly's career, it's shocking this ever got the green light. Holmes and Watson won't appeal to anyone. Nobody, even the diehard Ferrell fans will find very little to laugh at. It's just rehashed garbage from other better films that these two once charismatic stars were in. It's lazy in every sense of the word. Etan Cohen wrote of bunch of skits and mashed them into a feature length film, the performances are there, the best is given but with a script so thin and so absent of anything that is good, it's hard to form any sort of chemistry. The only reason I am not giving this turd the lowest score possible is because I did laugh four times, so in a 90 minute comedy I laughed, well, chuckled, four times, good job, Etan Cohen. Avoid this festering heap of swill, don't rent it, don't Netflix it, just don't. I wish the movie ended after the first scene (of which two out of four of my laughs came from), then I would've had time to do literally anything else. But instead I've wasted, with this review included, nearly two hours of my life with this dog poo of a movie on my brain. Not since “Jack and Jill” have I been so remorseful for willingly watching a movie. Please do not see Holmes and Watson. 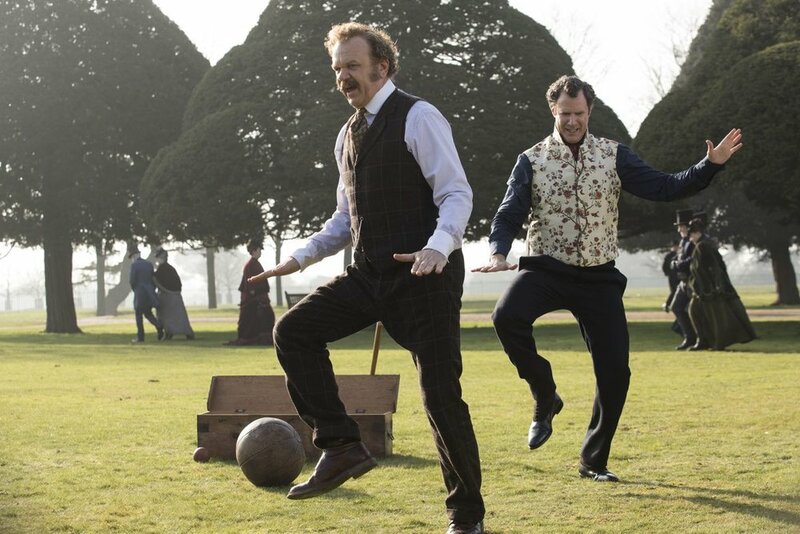 I give Holmes and Watson 1 star out of 5.